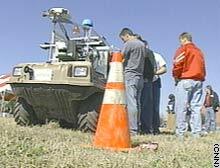 Students field tested "CajunBot" at the University of Louisiana before shipping it to the race in California. (CNN) -- A million bucks. That's the prize waiting at the finish line of a race fueled by stiff competition and the government's search for a better robot. Out of 25 teams invited to build unmanned vehicles for this week's race, only 20 made it to a qualifying racetrack in Fontana, California. The teams will be put through the paces, making sure they meet safety standards before they're allowed to approach the finish line Saturday morning. That's when the vehicles jam-packed with lasers, sensors, cameras and satellite-guiding systems -- but no drivers -- will try to navigate a 210-mile course between Barstow, California and Primm, Nevada. But the route will only be revealed a few hours before the race. The Defense Advanced Research Projects Agency, known as DARPA, is sponsoring the race, hoping that it will yield some spiffy technologies they can put to work in the battlefield. The usually secretive agency is best known for its major role in creating the Internet. There's a 10-hour time limit, and each robot will be trailed by a person in a vehicle, so that it can be stopped for any safety concern. The major players include a converted military Humvee outfitted for the race by Carnegie Mellon University and a souped-up Chevy Tahoe SUV nicknamed "Bob" by the California Institute of Technology (Caltech). A team from Palos Verdes (California) High School also did surprisingly well Monday with their Honda Acura SUV called "Doom Buggy" in the first round of qualifying tests. Students from the University of Louisiana at Lafayette, which does not have a formal robotics major, lost their first shot at qualifying Monday after a glitch with CajunBot, an all-terrain-vehicle-sized robot they hope will carry their team to victory. They have another chance to qualify Wednesday. The idea to enter the DARPA Grand Challenge spread by word of mouth among computer science and mechanical engineering students at the Louisiana school. They started their design for CajunBot in November 2003, a time when some competitors were already in the testing phase, knowing the odds were against them. "We're kind of like the Jamaican bobsled team," said student Scott Wilson, referring to the spirited underdogs who gained fame for their feisty spirit in the 1988 Winter Olympics. Caltech's "Bob" robot did well in the first qualifying round. The Louisiana team worked caffeine- and pizza-fueled all nighters "It's a challenge you don't get very often in the academic world. A chance to compete on a scale that this is," said computer science professor Arun Lakhotia, who helped with the project. He said a limited budget and no real expectations actually lifted some of the pressure off the team. "This is a lot more fun than working homework problems out of a book," said student Jonathan Raush. "You do get some real world application. To me, I look forward to getting something done, seeing a finished product." Like a race car, CajunBot is plastered with sponsor stickers. C&C Technologies, a Lafayette surveying and mapping company that specializes in building unmanned underwater vehicles, helped the team with navigation issues. Med Express, an ambulance service, gave the students a hand with logistics to get the robot to California in time. Student Scott Wilson checks some of CajunBot's electronics. Whether they win or lose, Lakhotia said the Louisiana team had learned some valuable lessons. 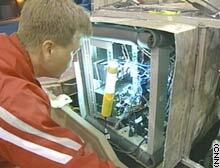 "This project definitely brought me closer to my own colleagues who have been just a few doors down," Lakhotia said. 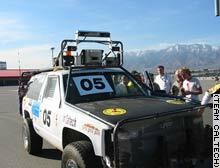 DARPA will announce the results of the Grand Challenge in Primm, Nevada, on March 14. Some spectators question whether any of the entries will be strong enough to survive the grueling course and make it across the finish line. If none do, the prize rolls over to next year. But Louisiana's team hopes to go home with a fat check. "We definitely want to win. We are in this competition ... to challenge the big dogs," Lakhotia said.